During an External Penetration Test, we conduct perimeter defense assessments of your firewalls, routers, public access web servers, network configurations, and other devices designed to protect your network from intruders. These tests help to determine the effectiveness of firewalls and other components used to defend your network from outsiders. By utilizing a broad range of software and other hacking devices, as well as manual probing in your Penetration Test, our team will provide a precise snapshot of your perimeter defenses. This will help us to explain in detail how to correct any deficiencies found in your systems. Our Penetration Tests are conducted in two parts. The first part is a “No Knowledge” testing scenario, where we take on the role of a rogue hacker with no previous information about your organization. We utilize this scenario to test how much information we can gather and use externally to attack and break through your perimeter defenses. The second part of the testing is done from a “Partial Knowledge” standpoint. In this scenario our audit teams are provided with some information that may be available to individuals within or familiar with the organization and may be utilized to externally attack, breakdown, or breakthrough your perimeter defenses. As with our internal audits, the software and network engineers best suited to your requirements and are assigned to your test. In addition, all testing is led by at least one of our CISA® Certified Auditors, a promise that most other companies cannot make. In the end, the CASE Financial combination of thoroughness and expertise allows us to make the best possible recommendations for protecting your customers as well as your organization from external threats. For more information on how to become better prepared for your next compliancy audit by utilizing our industry leading External Penetration Testing, please feel free to download our informational brochure and contact us Toll Free at 1.877.728.9627. Become compliant with government regulations. Protect your valuable customer data from potential external threats. 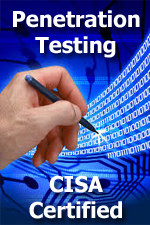 CISA/CISM Lead Penetration Testing Teams. Solutions for any deficiencies found in your external network security. Minimizes interference with your daily operations. Please visit our Contact page to request more information about Penetration Testing.